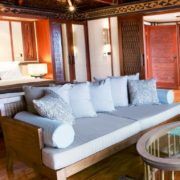 For the ultimate luxury romance in Fiji, this vacation combines the impeccable beauty of Fiji with the rarest of amenities. 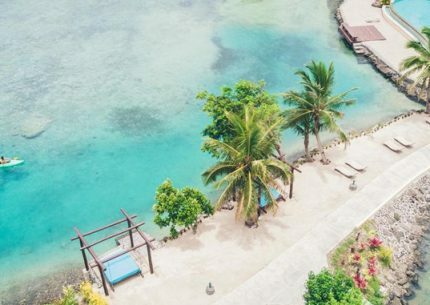 Two enchanting islands where luxury meets culture, overwater bures hovering over reefs teeming with marine life, and unlimited free drinks and meals make this package a paradise within a paradise. Watch the vividly colored fish of the fringing reef from the comfort of your grand bathtub while sipping a glass of champagne. 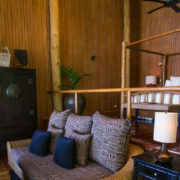 Your elegant overwater bure is equivalent to staying in an elegant resort situated in the middle of an aquarium. 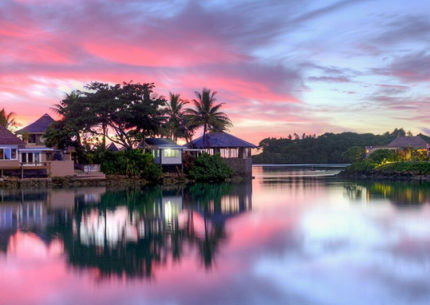 From there, you’ll make your way to an island where tidepools spout water in majestic displays right beneath your resort hot tub. 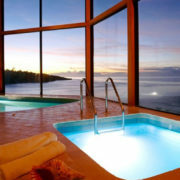 Your resort is the epitome of luxury where amenities range from awe-inspiring ocean views to jacuzzi hot tubs – not to mention free meals and unlimited alcoholic drinks! In this exotic locale, the views are flawless, the amenities are plentiful, the memories are unforgettable, and stress is an impossibility. Private Outdoor Dining – Private Waterfall in the Rainforest, The Beach, etc. 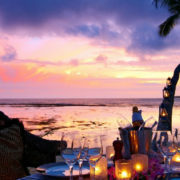 The luxury romance in Fiji itinerary is flexible and can be tailored to suit your needs. Make your way from your hometown to Nadi, Fiji. 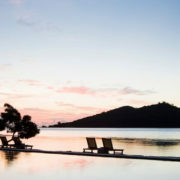 Your Fiji travel specialist can help you book both your international flights and US domestic flights. We find great rates on the best long-long airlines. 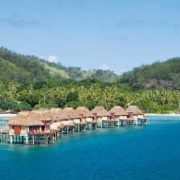 You’ll travel to Fiji overnight and wake up in Nadi, losing a day as you cross the International Date Line. Don’t worry, you’ll get it back on your trip home. A short shuttle service will take you from Nadi International Airport to Port Denarau. From there, enjoy a scenic boat ride to your island home. 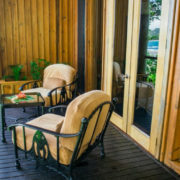 The very best of Fijian marine life can be seen while you eat freshly picked fruit from your private balcony or sip champagne in your grand bathtub. 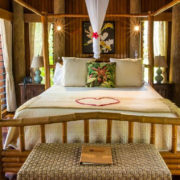 You overwater bure is pure elegance and luxury surrounded by flawless Fijian beauty as the crystal waves and curious marine life exist right beneath your intricately designed villa. 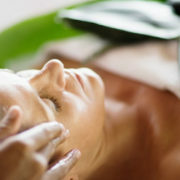 Enjoy world-class spa treatment to the stunning view of lush green hills and the sparkling ocean. 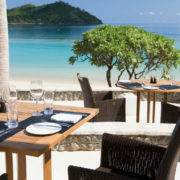 Gourmet meals are included in this package, and they are prepared by expert chef Shane Watson, are comprised of the freshest local ingredients, and served at the resort restaurant in front of hypnotizing views as the moon lights up the ocean surface. 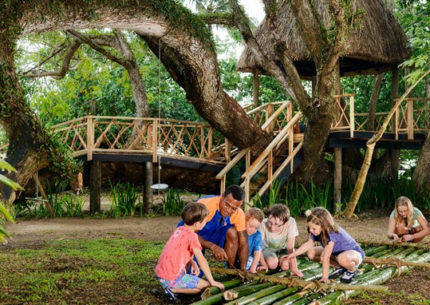 While it might be difficult to tear yourselves away from the enchantment of your overwater bure, this island has a seemingly endless supply of activities that will highlight your vacation in memories that will not soon be forgotten. Spend your days parasailing, handline or sport fishing, scuba diving, snorkeling, island hopping, and visiting local villages to get a taste for traditional island living. 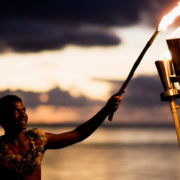 Meke dances and Kava ceremonies give the nights that authentic Fijian feel before you retreat to your romantic sanctuary perched in a tropical heaven. 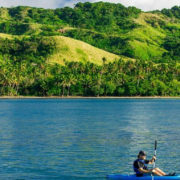 A boat ride to Port Denarau, a shuttle service to Nadi Airport and a short domestic flight will take you to Fiji’s second largest island and the city of Savusavu. 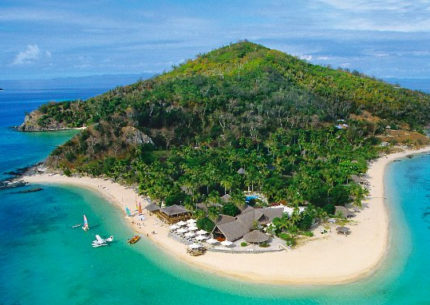 Here’s you’ll take a ride to your next luxury resort in Fiji. On this island, you’ll enjoy luxury at its finest, adventure at its most thrilling, relaxation at its most serene, and all without every thinking about price! 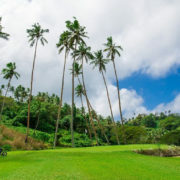 Everything is included at this exotic dreamland, from island cocktails to gourmet meals to virtual golf! 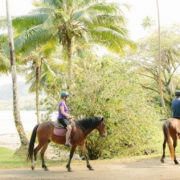 Enjoy horseback rides on the beach, town tours and hiking trails, or such exhilarating activities as jets ski tours, in-water trampolines, and standup paddle boarding. Enjoy your included meals at the elegant restaurant, or at a picnic setting under a private waterfall! Luxury is thought of to be every amenity at its absolute finest. Here, ultimate luxury is having all of those amenities without ever having to inquire about price. 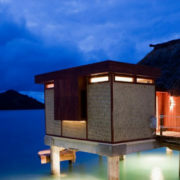 Namale’s Valeni Sasauni Spa Sanctuary is a leading luxury spa in Fiji, offering amazing view of the ocean. You can pre-book your spa experience to ensure availability and receive a discount. 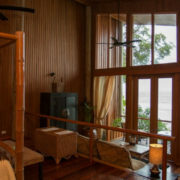 Select your choice for a relaxing 75-minute massage from True Swedish, Deep Tissue, Total Release, Traditional Fijian Bobo Massage, Mother Magic, Reflexology and Ultimate Fusion. Share the magic and rejuvenation of the Signature Massage Therapy with the one you love. 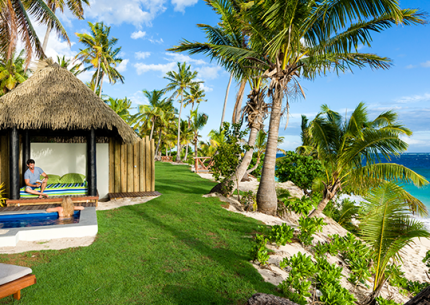 Imagine enjoying a Fijian sunset from a private room, overlooking the Koro Sea and you and your partner indulge in a romantic spa experience. 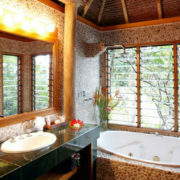 Start with a foot soak and a glass of bubbles, followed by a 90-minute massage of your choice. Just before the sunsets, you will be left to enjoy each other’s company as you share a bottle of champagne and hors d’oeurves for a grand sunset. Enjoy a Milk bath foot soak followed by a 90-minute massage with sensual oils, adorned by candlelight and showered with flowers. This romantic experience then takes you to a private Hydrotherapy Room for a special moment in time with your partner (1-hour treatment). Situated just outside Savusavu, Namale offers some of the best diving in Fiji! Namale’s Five Star experience extends to its diving program with a brand new custom-built dive vessel, new equipment, attention to detail and personal service. Just a 10-15-minute boat ride from Namale you’ll find sheer vertical walls, seamounts, breathtaking seascapes and an incredible array of reef fish and coral. Sites such as Dream House, Leapper’s Wall and Purple Gardens are bound to leave you in awe. Not much further you’ll find sites such as Yellow Wall, Grand Central Station and The Chimneys in Namena Marine Preserve. 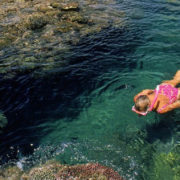 There’s also an option to head out to the barrier reef sites In the Somosomo Straits near Taveuni to see famous dive sites like Rainbow Reef and The Great White Wall. 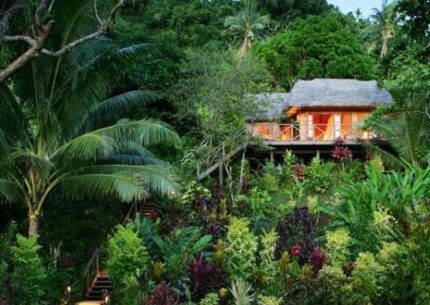 This Premier Fijian destination truly has it all! Dive packages range from 1 Day to 7 Days. Each day on the water includes two tank boat dives and use of tanks and weights. You can rent gear at an additional cost or bring your own. You can book at the resort or pre-book with your Fiji Destination Specialist to get the Namena Marine Reserve surcharge waived (approx. $40 US per person). Enriched Air Nitrox upgrade is also available. If you’re not already certified to dive, take the fast track and learn first-hand what Fiji’s breathtaking underwater world has to offer. This introductory SCUBA lesson & Reef dive includes poolside, and in-pool instruction plus an open water reef dive. You can even add more dives! Namale also offers Open Water Qualifying, Training Dives and Full SCUBA Training & Certification. No matter where you are in your SCUBA certification journey, Namale is for you. A short domestic flight will bring you back to Nadi International Airport. You’ll fly from Nadi, Fiji to the US, gaining the day you lost back. Amazing Family Friendly Resort w/ Free Kids Club & Transfers. Great Price for Teens! 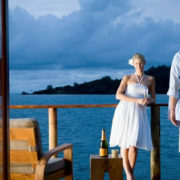 Fiji Honeymoon on Private Island w/ Romance Package, Meals, Fiji Flights & Transfers.